CONS: Maybe just a tad pricey? Palm's PDA sales may be falling on lean times, but their hugely successful Treo650 smartphone continues to do brisk business, supported by an army of passionate developers producing a vast range of applications. 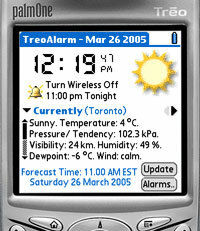 TreoAlarm is a neat program designed to replace the basic alarm functionality that ships with a Treo, letting users configure up to eight different alarm schedules, with the ability to set different sounds depending on the time and/or day (so maybe you'd select a particularly stubborn alarm for a Monday morning and something more relaxing for a hangover-laden Sunday afternoon). Any way you like to be woken up from your slumbers, this application can offer it (within reason! ), with options to set how long the alarm tone sounds, whether the phone should vibrate or not, how many times it should repeat, how long the gap should be between each repeat, and the minimum starting volume. Although the smartypants alarm gizmos are pretty impressive, TreoAlarm's got a better trick up its sleeve. Minutes before its due to wake you up from your sheep-counting, the Treo can wirelessly download an up-to-date weather report and five day weather forecast, letting you know whether it's worth getting out of bed or not. 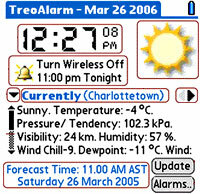 The information is presented on TreoAlarm's clear and simple interface, with weather icons displaying sunny, cloudy, rainy or stormy conditions. Underneath a text box offers more detailed weather information. The program comes with some other useful tricks, including the option to turn the phone on and off at predetermined times to save battery life (and avoid early morning calls from your boss). With full support for the 5-way directional control on the Treo, the program makes a practical and easy-to-use travel/home alarm clock and weather forecaster and represents excellent value for $18.50 (�11, E15). Our verdict: 90% - Must-have Treo application!